Sign Up for Email List or Have a Question? One week ago, I was in California visiting my son and family. The temperature was in the 60’s to 70’s with clear blue skies. It was sunny and dry during the visit; and I was truly able to relax knowing that my Long-Suffering/Trophy Husband was back at home taking care of the critters. It was wonderful to play with the grandchildren, knit and watch movies. 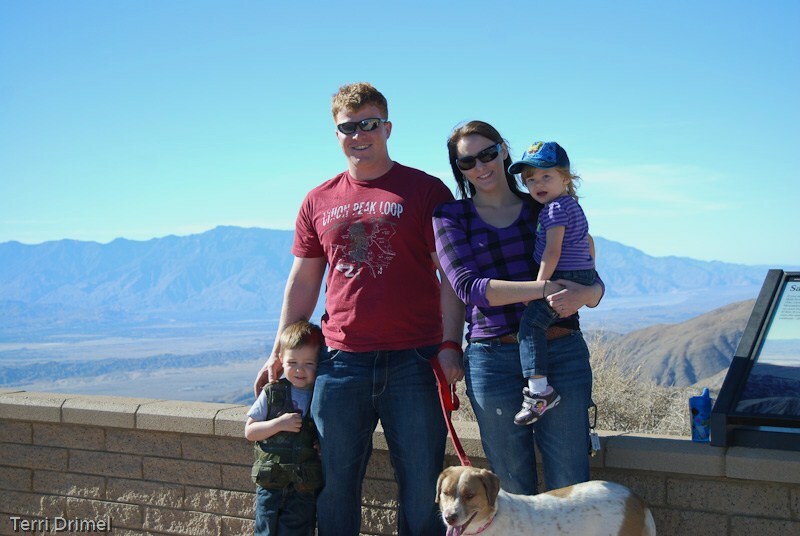 We went to Joshua Tree National Park one afternoon. At first, Grandson Liam was confused when he found out the “park” didn’t have a playground. We had a nice picnic lunch and everyone scrambled on the boulders. Meanwhile, back at home in Minnesota, a snowstorm was raging! With a tinge of guilt, I enjoyed a warm, pleasant afternoon in the sun. 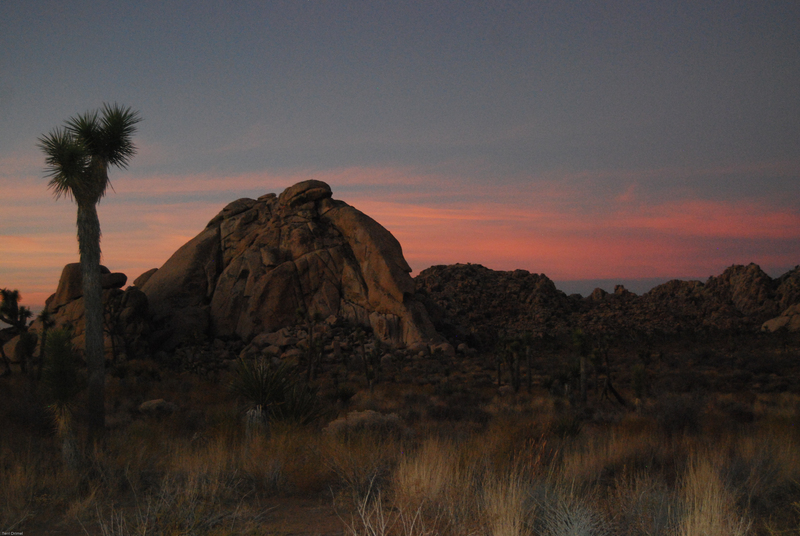 Joshua Tree National Park at sunset. 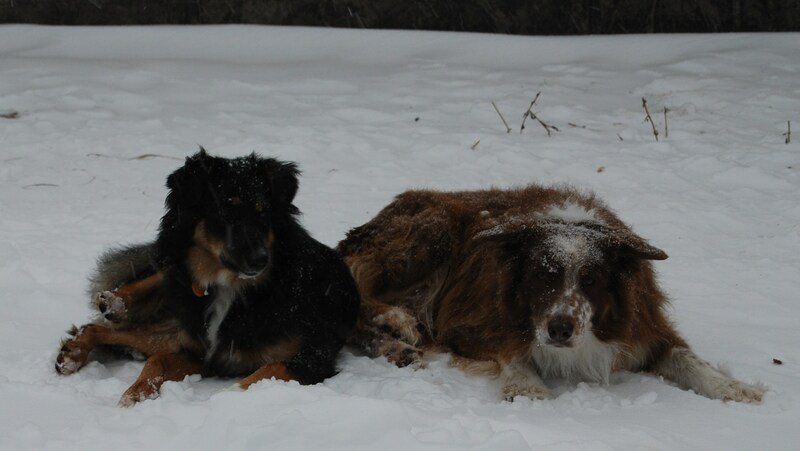 I took a few photos today of critters in the snow. (It’s a bit tough to get a really good picture with the white background.) Enjoy! Finn ram Eino with his girls. 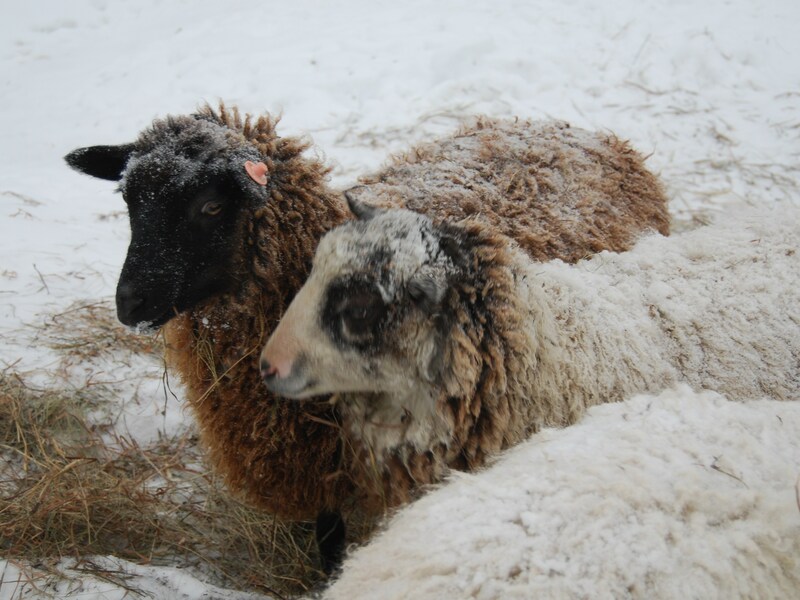 The snow-covered sheep in the foreground is black Finn Emmi. It's warm under all that wool! Oops. I’m late. Actually, I have not been motivated to blog the last few weeks. Can you tell? The posts have slowed down. Between the sick lambs, and record heat, humidity, and thunderstorms we try to get work done in the barnyard. The muck seems like it is knee deep (but not really) and the llama dung piles continue to grow. (It’s hard to clean the barnyard when it is in a constant state of mud…) We have the fans running in the barn and plenty of fresh water and shade for the critters. As I fill the water trough, I spray several of the llamas with the cold water from the hose. Karma, Nessa, and Minah enjoy having their neck, legs and undersides sprayed. After that they roll in the dirt; water + dirt = mud. 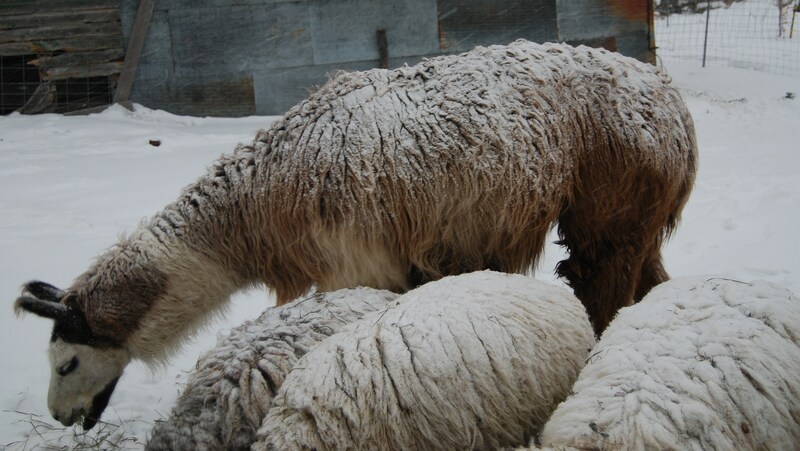 Caked mud in their fleece – is good to help discourage flies – but bad for the Shepherdess who has to wash it out! In this photo, the weeds at the left are about eight feet tall. They are in an area which has not been reclaimed yet. The grass is much greener than shown in the photo. 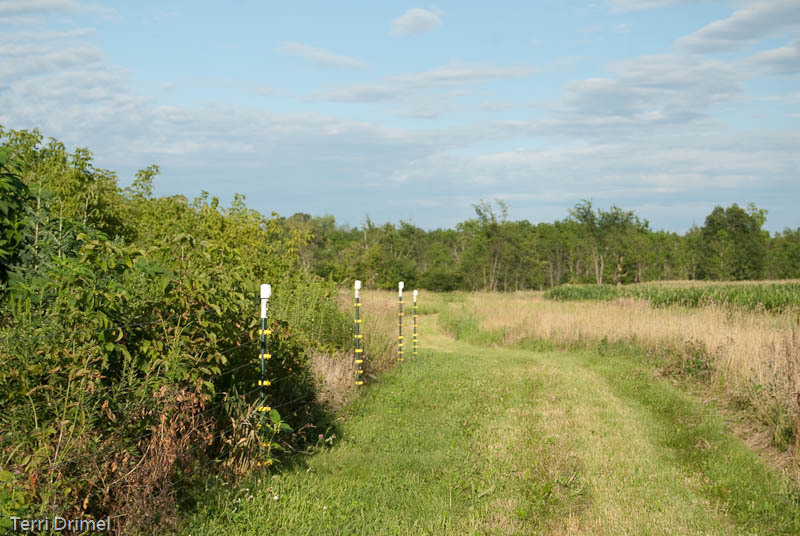 This lane leads to a back pasture of about eight acres. The good news about all the rain is that we will have forage for the flock well into October or November. I thought of taking a photo of the rain gauge. But, quite honestly, I am sick of looking at it. It has another two inches of rain in it from Thursday’s storms. 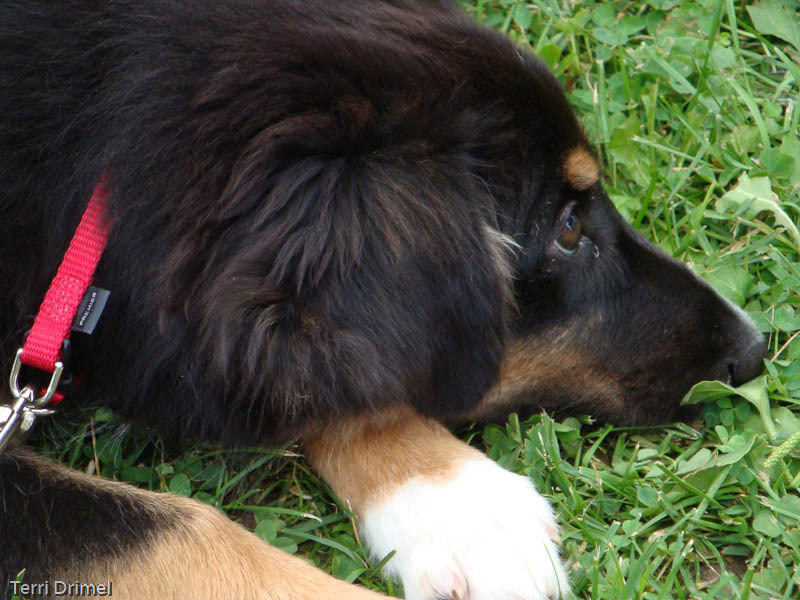 On a good note – Australian Shepherd pup Molly is doing great! Here’s a photo of her lying low in the heat. 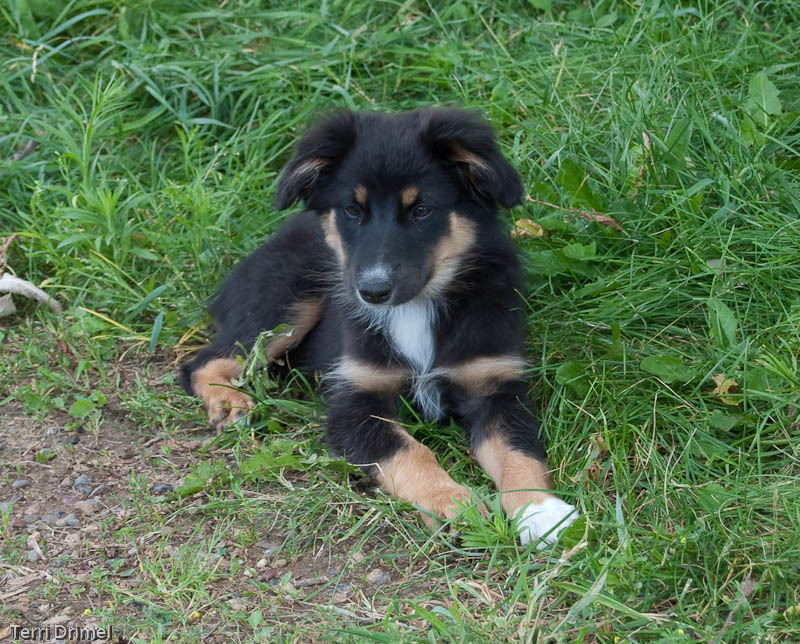 Molly, our new tri-colored Australian Shepherd has perked up after her traumatic first day spent traveling to her new home. At 11 weeks old, she already seems to be housebroken. She whimpers if she needs to go outside and has not had any accidents inside the house…yet. In between puppy naps she barks at the cat and is beginning to explore the house as far as we let her. She is learning her name, as well as what toys are good for – playing! 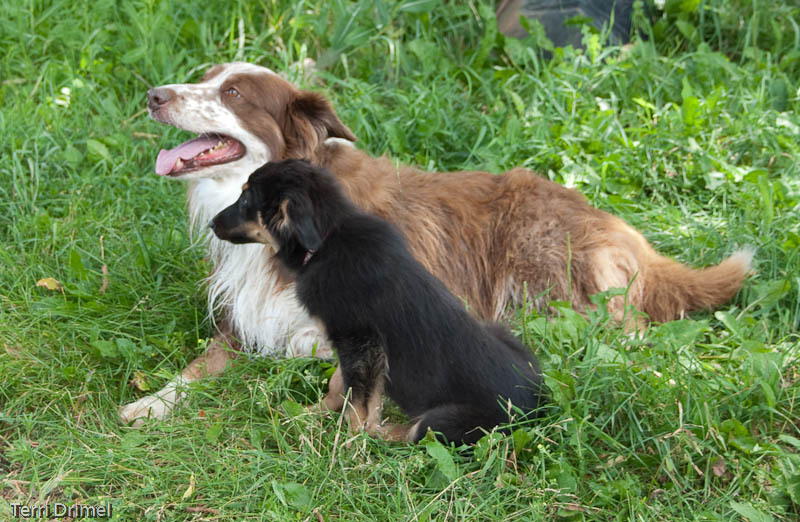 Gus, our Border Collie, is very tolerant of the puppy. Molly runs around him, jumps up and tries to entice him to play. He just ignores her by sitting or walking away. When he sits, she sits. Good puppy! The Etsy Shop is Now Open! Winter – Will it Ever End? 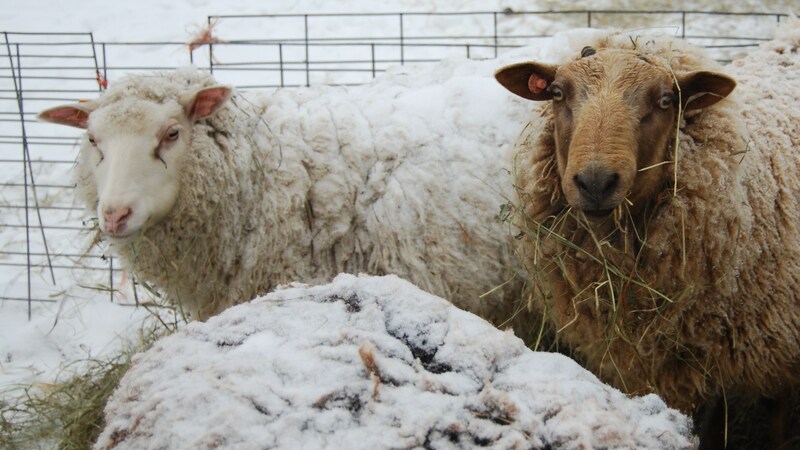 Shearing Day – Fleeces available! Sheep 101 and 201 – Excellent! All text and images on all pages copyright Terri Drimel, Roundabout Acres, Center City, MN USA.